India’s vice-captain Rohit Sharma smashed another ODI hundred at the Cricket Club of India (CCI) in Mumbai, a venue where he played many matches as a young boy. India’s vice-captain Rohit Sharma smashed another ODI hundred at the Cricket Club of India (CCI) in Mumbai, a venue where he played many matches as a young boy. After receiving the man of the match, Rohit admitted at scoring big at CCI felt special. “I have played a lot of cricket at the CCI. It’s a very good pitch and you get value for the shots. You don’t need to hit the ball hard here. You just need to place the ball in the gaps. That’s what I was trying to do. 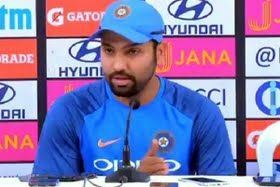 When you come to a ground where you have played enough cricket, you feel confident going into the match,” Rohit said at the post-match press conference. Although he was dismissed for 162, Rohit stated that the thought of a fourth double century did not cross his mind. After Rohit's heroics, Khaleel Ahmed picked up 3 for 13 as India rolled over the Windies cheaply to go 2-1 up.